The XE-1 AP is an unusual analogue controller manufactured by Dempa. It was primarily designed for the Sega Mega Drive, but is also compatible with the Sega CD and 32X add-ons as well as several Japanese computers (some require extra adapters). The device was not released outside of Japan, though is revolutionary in many ways due to the fact it was released in 1989 - nearly a decade before analogue features of this nature became mainstream. Ahead of its time, it was the first controller to feature an analogue thumb-stick, analogue slider, shoulder buttons and grip handles. Ten face buttons, including six buttons and four switches. Analogue slider, which can be rotated to suit the user. It allows for a third analogue axis or throttle. Many of the buttons exist as switches to maintain compatibility with the computers the controller supports. Others are turbo switches, or are simply not used in the majority of circumstances. There is also a switch to turn the controller back to "digital mode", allowing it to remain compatible with all games on each system (aside from computer games that do not support joysticks). The controller was an attempt at simulating/miniaturizing the HOTAS controls of Sega arcade cabinets such as After Burner II (running on the Sega X Board system) on a handheld controller for home systems. Around 1994, it was re-released with a revised price of 9,800 yen. Support for this controller largely remains in the Westernised versions of these games, with the notable exception of After Burner III, which instead features 6-button support (the Japanese version is 3-button or analog only). It is not known whether this holds true for the two 32X games. It is also unknown if any home computer ports of Sega arcade games support the unit. Released in 1989, its use of shoulder buttons predates the release of the SNES controller in 1990. Its use of grip handles and four shoulder buttons also predates the PlayStation controller's 1994 release by five years. Its use of an analogue thumb-stick predates the Nintendo 64 controller's 1995 unveiling by six years and its 1996 release by seven years. Its additional analog slider was also a precursor to the second analog stick of the PlayStation's Dual Shock controller in 1997. 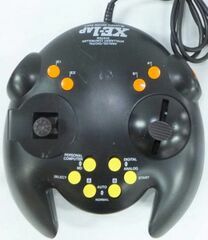 The XE-1AP is similar in design to the Sega Saturn's 3D Control Pad, released in 1996. In turn, the Saturn's 3D Control Pad was the basis for the 1998 Dreamcast Controller, which in turn was the basis for the 2001 Xbox controller, in turn the basis for the 2005 Xbox 360 controller.